Marine binoculars are used commonly for optical viewing, and they are some of the best-known devices to man. A marine binocular is an expensive but important piece of maritime security gear. Manufacturers tend to outdo each other when it comes to developing and making the best marine binoculars thus the market is flooded with different types. These devices range from various sizes and types because they are coming with different features. If you are out there in the market shopping for a marine binocular as a new buyer, then this review is for you. 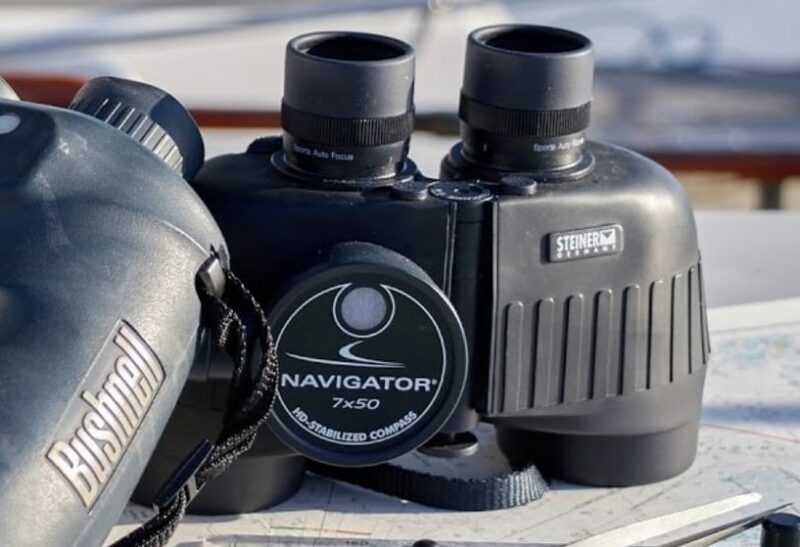 Whether it is animal observation, stargazing, or simply looking at objects at a distance when sailing, marine binoculars are an essential tool for any outdoor experience. To the best of our knowledge, we’ll be of much help in making sure you purchase the best binocular that is perfect for marine life. In this article, we’ll assist you in finding the best marine binoculars. 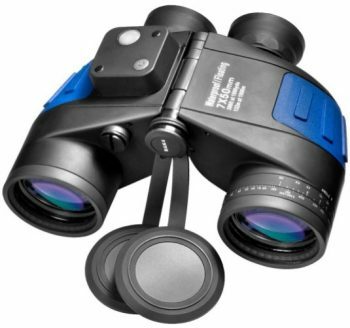 Below is a table for some the best marine binocular available on the market. Most marine binoculars have too much magnification for use on rocking, pitching boats. The larger the magnification, the better your view will be. Magnification is an important feature in a binocular as it sets the quality of your view. Greater magnification with more power is unrivaled when it comes to marine use. 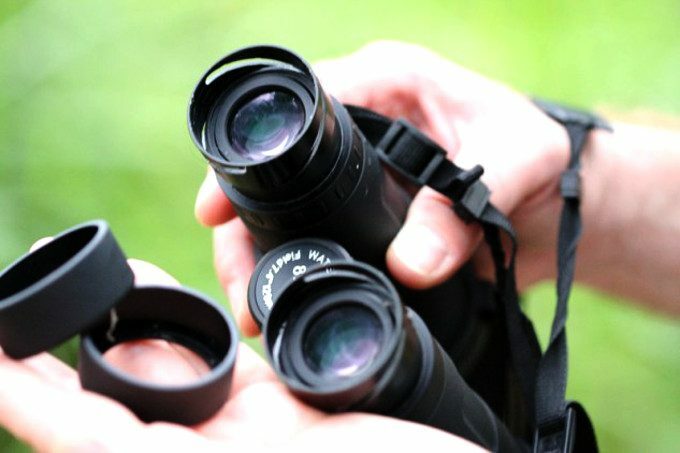 Choose those binoculars with a high magnification to provide the best sight. Good marine binoculars should have an integrated compass, but it also depends on your needs and preference, this is a bonus. The compass will give you a basic idea of direction at a glance. However, it is subject to the magnetic deviation, which varies from location to location. With this feature, you can pinpoint the bearing of a particular subject. Some compass systems are illuminated, and some are not. If you find out that you need this particular feature, then make sure that you get a compass that lights during the nighttime hours. It is important that you get binocular that is waterproof and fog-proof, which you can use in the marine world in case you have any worries that your binoculars may go overboard and fall into the water. Make sure that you get the marine binocular that contains an O-ring seal and are nitrogen purged. This feature will make sure that the inside of your marine binoculars will have protection from corrosion are from all types of water and moisture. The field of view is the angular width of your image at 1,000 yards. In simple terms, lower magnification often means a wider field of view. The better field of view lets you see more without adjusting your binoculars. With a wide field of view, it will be easy to locate subjects when you are looking through your binoculars. It also makes it that much simpler to find small and fast moving ones at closer ranges. The binocular lens size determines the amount of light that enters into your binoculars. The larger the objective lens of the binocular, the more light your binoculars let in, which is of particular importance in low light conditions. Larger lenses, however, would mean heavier and bigger binoculars. A decent marine binocular will be fully multi-coated for maximum image brightness. The objective lens size provides what many people believe to be the best trade-off of size versus light gathering ability. Eye relief is surely something to be considered if you are a wearer of eyeglasses. You can use your binoculars without wearing glasses and the binoculars focus will compensate if you are near-sighted or far-sighted. Eye relief is the maximum distance from the eyepiece at which you can see the binocular’s full field of view. The drawback to longer eye relief is that it can reduce the field of view. The marine binoculars size and weight depend on you. Weight and size is a significant factor when choosing binoculars. Because a good marine binocular must be built tough, and weight will usually exceed what you find in a standard field binocular. It’ recommended to get a light weighted marine binocular. Lighter binoculars will allow extended usage without feeling like you have brick tied around your neck. 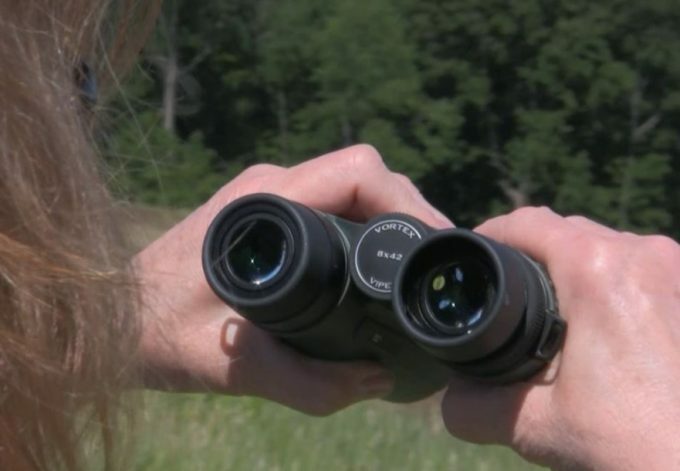 Choosing the best marine binoculars can be difficult than you might initially anticipate because there are many great options available on the market. Based on your own particular needs, wants, and specifications, different binoculars will appeal to different people. 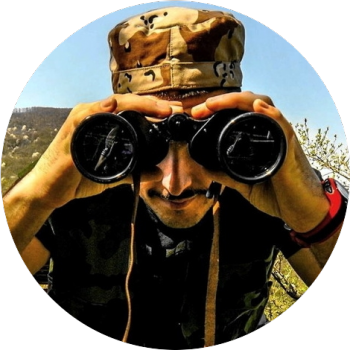 Without much ado, let’s discuss some of the top marine binoculars. Description: The H20 Porro Prism Binocular from Bushnell delivers a fog-proof/waterproof covering and rubber armoring textured with a very soft ridge to maintain excellent grip. This H2O Porro prism binocular offers greater depth of field and less light loss than comparable roof prism designs. They’re nitrogen purged, and O-ring sealed to ensure stunning views no matter how wet they get. To improve lighting clarity and transmission, they contain multiple-covered optics along with superior quality BaK-4 prism window. The eight magnification powers with the 42 mm objective provide excellent viewing for both close-up detail and scanning the field of view. A dioptric ring, twist-up eyecups, and a large center focus knob supply customized and comfortable viewing no matter what the conditions you find yourself. Whether you’re interested in birding, hunting, travel, watching sports, or general use, Bushnell H2O Fog-proof/ Waterproof Porro Prism Binocular is binocular that will fit your budget and your needs. 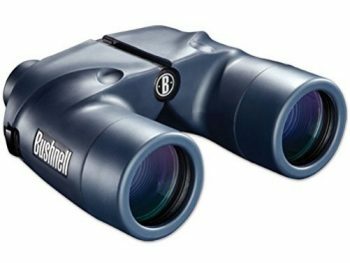 Related: If you are looking for a pair of binoculars that is suited specifically for water use, you may have to check out the Bushnell Marine 7×50 Waterproof Binocular, they are built in compasses, and are hermetically sealed. Description: The Steiner 7×50 Marine is a water-going binocular for enthusiasts who want the most performance for their money. 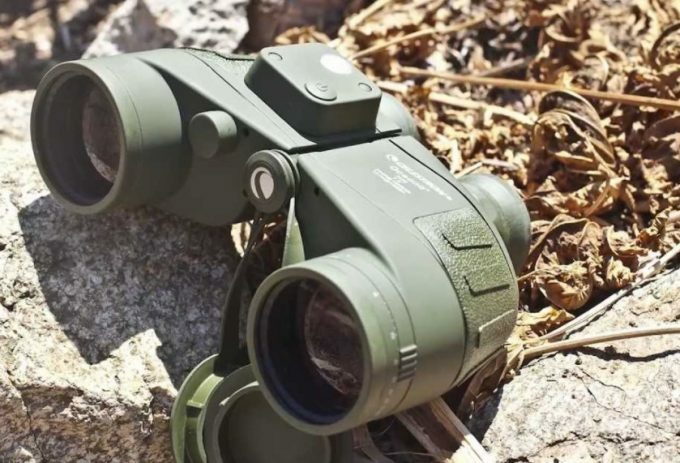 Designed with broad objectives and moderate magnification, the Steiner Optics 7×50 Marine Binocular is an ideal choice for hunters, boaters, and outdoor enthusiasts. The front lens covered of the binocular fit well and snapped in and out quickly. They can sometimes require extra effort to flip them down and out of the way because they’re hinged at the center of the binoculars. For ease-of-use, the Marine binocular is outfitted with Steiner’s Sports-Auto-Focus system that allows each eyepiece to be individually focused on ensuring the sharpest views possible. The quality and durability of the binoculars are extremely well done. Whether on the rolling seas or in the wild outdoors, the Marine binocular will be your constant companion for all your glassing needs and would work well. Related: If you just want a pair of specs to occasionally take near the water without fear of ruining them beyond repair, then the Athlon Optics Midas 8×42 ED Roof Binocular is for you. 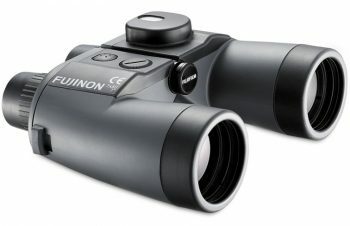 Description: The Fujinon Mariner 7X50 WPC-XL Porro Prism Binocular gives you all the benefits of multi-coated lenses, an ultra-strong polycarbonate housing and a 100% fog-proof design and waterproof, which allows them to float at a meager price. The reticle display and compass is visible through the eyepiece. A translucent panel above the compass provides a bright view of the heading under daylight conditions. The Binocular comes equipped with a LED-illuminated compass so you can keep an eye on your location as well as your surroundings. Fully coated optics provide bright and sharp images with reduced glare and distortion. For use after dark, a nightlight is built into the compass. 18 mm of eye relief makes them perfect for eyeglass wearers. The compass LED illumination and activation button are on the left objective, away from the compass itself, to avoid electrical interference. With Fujinon Mariner Binocular, you can see everything clearly, whether you’re spending the day on the boat or going out on a fishing trip. Related: If you’re looking for top recommended Hooway 7×50 Waterproof Floating Marine Binocular Compass for Navigation & w/ Internal Rangefinder, Water Sports, Boating, Hunting is our suggestion. Description: The Bushnell Marine 7×50 Waterproof Binocular is the ideal item for the marine environment and comes handy in other situations too. They utilize industry-leading components, such as the large objective lens diameter and Porro BaK-4 lenses. The Bushnell Marine 7×50 model is even hermetically sealed to assure further that no moisture creeps in. These binoculars can also be adapted to fit onto a tripod. They also have roll-down eyecups, important for those who wear prescription sunglasses or eyeglasses. This binocular is of a Porro Prism design and come equipped with excellent quality multi-coated optics. 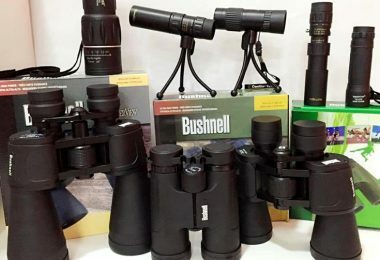 Without sacrificing any technology, Bushnell binocular packed dozens of helpful features into a manageable, economical, tool. The premium BaK-4 prisms and fully multi optics glass will give you the brightest and sharpest views. 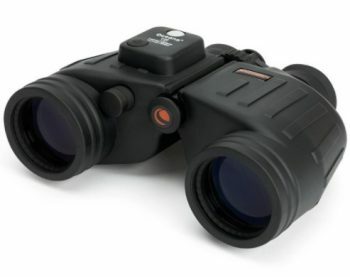 These binoculars are built to withstand shock and are non-slip to boot due to the durable rubber armoring, making it perfect for use in the high seas. Related: If you need a better mounting fit, take a look at these Aomekie Ultimate 7X50 HD Marine Binoculars including Illuminated Rangefinder Compass. 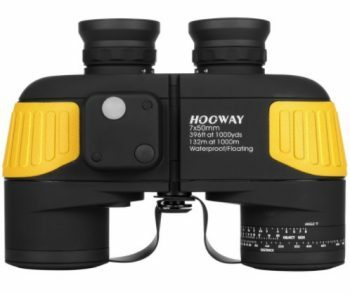 Description: The Hooway 7×50 Military-Marine Binoculars are made to fulfill armed forces requirements and it extreme sturdiness makes this binocular practically effective in any environment, even under severe rainstorms or high humidity condition. The marine binocular is equipped with cutting-edge technology that enables them to provide a comprehensive and crystal clear view. The binoculars also feature an illuminated Compass and an optical range finder that allows you to determine the distance of a given object. Individual eyepiece focus systems offer the freedom from focusing when viewing objects at medium and long distances. 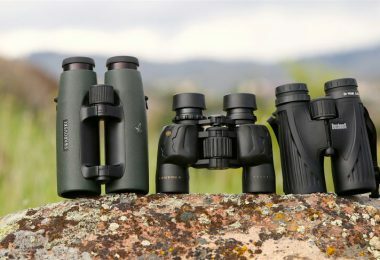 The binocular has Porro prism designs that provide a broad range of view, and are enhanced by Premium BaK-4 prisms, and fully FMC coated optics that transmit the light very efficiently and reflect a bright and high definition view. Related: If you intend on using this binocular in an extreme weather condition, it’s best also to buy Marine 7×50 Internal Rangefinder, Waterproof Floating Binocular. Description: The BARSKA Deep Sea 7×50 is a popular, easily manageable binocular size that permits a steady image even under agitated ocean conditions. This binocular is waterproof, fog-proof, and design with a non-slip ergonomic rubber, fully multicoated BAK4 prisms for crisp images. With 7x magnification, this Deep Sea Barska 7 x 50 Binoculars provide clear views of marine observation from dusk till dawn. The Porro prism feature offers greater depth perception and a wider field of view. It’s O-ring sealed for complete waterproof protection and Dry nitrogen purged and sealed to prevent fogging and moisture damage in all weather conditions. The ergonomic rubber and non-slip design to create a secure grip. The 7×50 Waterproof Deep Sea binocular has individually focused oculars, and it floats if accidentally dropped into the water. Related: If you’re looking for a binocular that can be used for all your outdoor activities, then HD 10X 42 High Powered Compact Binoculars for adults is your best bet. Description: The Nikon 8208 Oceanpro 7 X 50 MM binocular is nitrogen-filled and O-ring sealed for waterproof, shockproof and fog-proof performance. 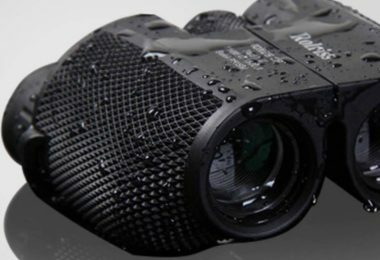 This binocular prevents fog from building up and is capable of repelling moisture. The armored rubber that surrounds the binocular makes for easy gripping and protects from drops and scratches. 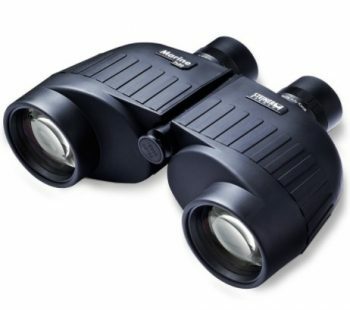 The polycarbonate body is well built and provides the binoculars adequate capacity to handle shock and impact. Nikon OceanPro 7 x 50 mm marine Binoculars is perfect for boating, hunting, and general observation because of its lightweight and 100% Waterproof/ Fogproof body. The large, 50mm objective lenses offer a 7.1mm exit pupil for maximum light gathering, while the large central focus knob and diopter make focus easy to achieve and maintain. Extra-long eye relief of 22.7mm makes them a reliable choice for eyeglass or sunglass wearers. Center focusing offers you a clear view in the least amount of time. The OceanPro exploit precision-ground lenses with multiple layers of anti-reflective coatings to deliver enhanced resolution, superior brightness and critical high-contrast for low light and adverse weather conditions. Related: If you own a Nikon 8208 Oceanpro binocular, you may also consider Fujinon Mariner 7×50 WPC-XL Porro Prism Binocular. Description: The Celestron Oceana 7×50 is a waterproof binocular designed for marine and land-based observations. It has a large 50 mm objective lens to offer maximum image brightness even in low light conditions, like dusk and dawn. This binocular also comes with an illuminated compass that is practical as a navigational tool for both land and sea. This binocular designed to fend off any corrosion or rust, and is entirely shockproof & waterproof, and resisting violent impacts. Maximum optical performance is appreciated with the fully multi-coated optics and BaK-4 prisms for ultra sharp images with high resolution and contrast you get from the Celestron Oceana 7×50 Binocular. This feature-packed model includes an illuminated compass for direction finding, a reticle for distance measurement, and a convenient cent. These Rubber Armored gadgets can withstand many years of usage under the harsh marine environment. 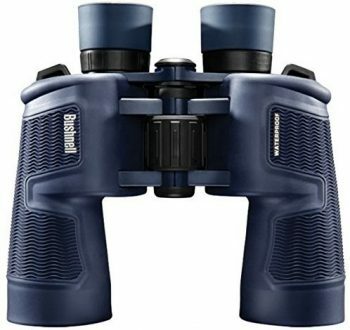 Related: If you find the current fittings aren’t a good match for you, we recommend Celestron 71422 Cavalry 7×50 GPS Binocular. If you are searching for top quality marine binoculars with exceptional craftsmanship and performance, you can consider the above-reviewed binoculars. 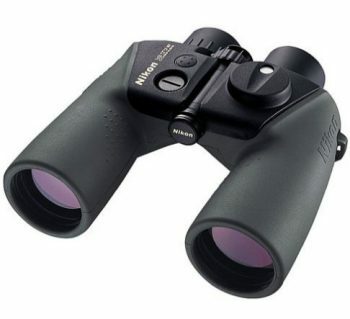 By reading this marine binocular reviews and weighing your options, you should be able to find something you love, and you will end up with one of the best and top rated performing binocular that would not disappoint you. Thank you for reading our marine binocular review, and if you have any further questions, please do not hesitate to comment.